Sometimes a hall isn’t just a hall. Surely that’s the case for the new St. Matthew Parish hall, which finally opened after years of dashed hopes, bureaucratic delays, unexpected setbacks, and a brutal winter construction season. 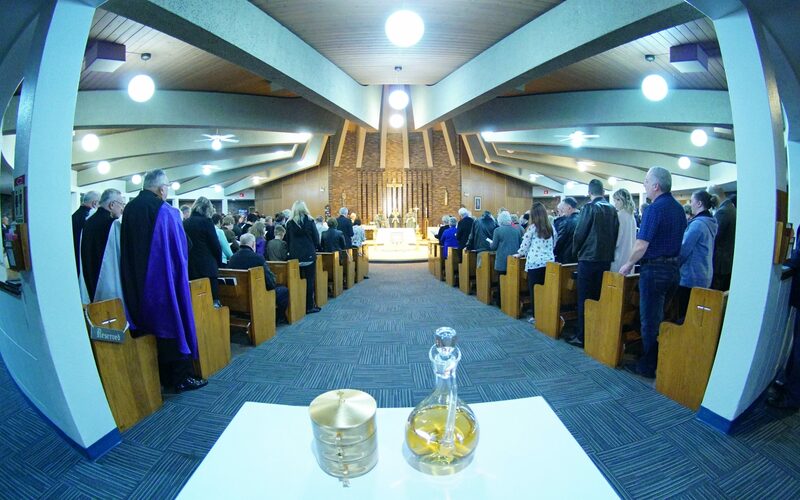 But the frustrations were mostly forgotten on September 30, when Archbishop Richard Smith cut the ribbon at the sparkling new facility as part of the northeast Edmonton parish’s 50th anniversary celebrations. 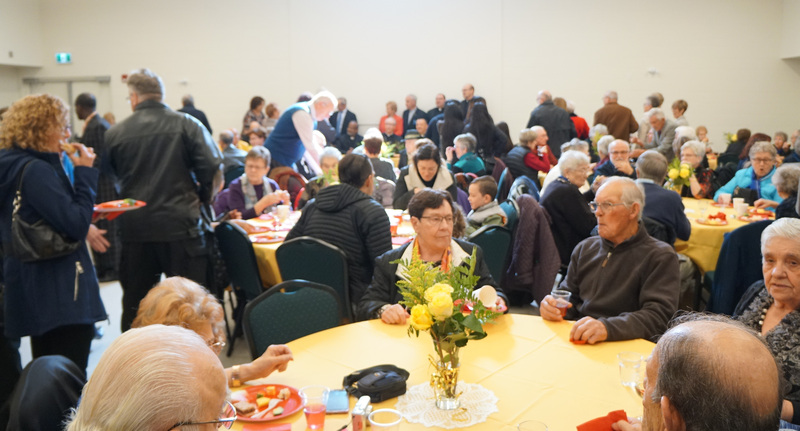 For more than 400 current and former parishioners who streamed through, it was the first chance to check out the long-awaited $2.7-million structure, which is connected to the church and replaces the old rectory that had been used for offices. Its completion represents a concrete means of building community, said Gary Friedel, who chaired the building committee and served as project manager. Previously, the only gathering area at the parish was a small room behind the altar, which had the double role of meeting space and cry room for parents and small children. Funeral lunches, retreats, socials and similar events had to be held in a nearby community hall or school. The hall seats about 180 people at tables and can accommodate more without tables. Norma Jani, who chaired the 50th anniversary celebrations and also served on the building committee, said the new space will make a big difference in small ways. “It’s the fact that we have a space, that we don’t have to go to a different hall when we have a celebration,” Jani said. “It’s a nice opportunity to get together and have hospitality. Our meeting room was definitely too small. The new structure also includes modern offices for the pastor, Father John Mariapragasam, and three office staff. Among the crowd that came to see the hall and celebrate the anniversary Mass was Father Paul Moret, the pastor who spearheaded the building project, who was presented with an honorary gold shawl. Father John and four other previous pastors also concelebrated the Mass with Archbishop Smith. A certificate of blessing from Pope Francis was unveiled before people dispersed to thumb through historic photos in the archives or enjoy lunch and wine in the hall. 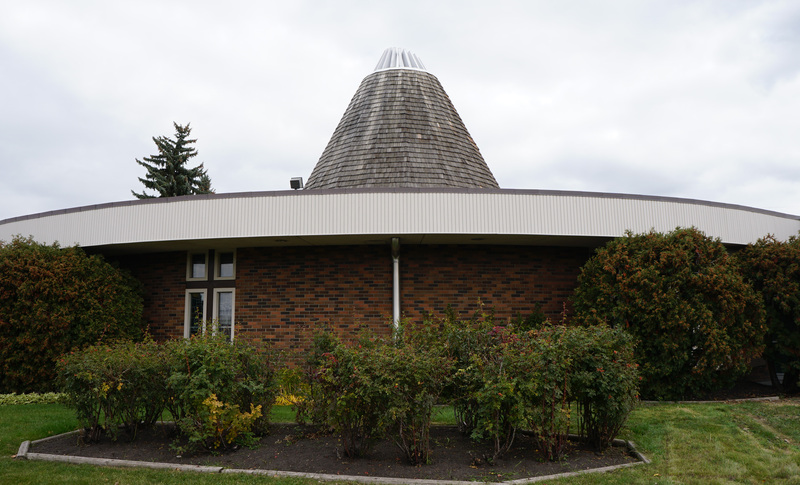 Back in 1968, when the iconic round church was first built at a cost of $270,000, it was common for churches to include a hall in the basement. No one is really sure why that didn’t happen at St. Matthew’s, but finances may have been one reason. Another, said Friedel, may have been that the round building with its sloped interior floor made basement construction impractical. The need for space became more acute when St. Francis of Assisi Parish to the east was closed, meaning more families for St. Matthew’s congregation and more Catholic schools within its parish boundaries. Once the St. Francis property was sold in 2005, the archdiocese earmarked some of the proceeds for capital spending at St. Matthew, and that, eventually, was enough to kickstart the hall project. At one point the parish was able to enlarge their parking lot by buying a neighbouring house and demolishing it; as it turned out, that was key to getting a development permit for the new hall and offices. “And even with that, the city put us through four months of hoops to finally approve the existing parking,” Friedel said. 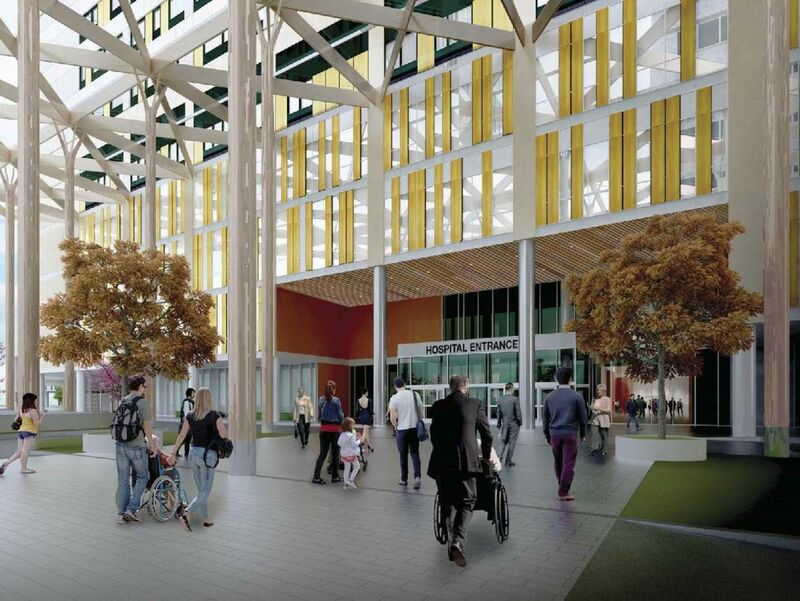 With more than 20 years’ experience as a building contractor, Friedel said he’s never experienced the kind of frustrations and roadblocks he did with the St. Matthew’s project. Starting in 2014, there were delays in the design phase. Then architects and the engineers were slow in filing their documentation. When they finally began demolition of the old structure in May 2017, they discovered asbestos particles in the drywall taping mud. That meant weeks of painstaking removal of the drywall by a hazardous materials crew and added another $25,000 to the cost. The plan had been to complete much of the work in the summer, and complete by Christmas. Instead, builders began pouring concrete in October, using dryers against the severe cold. 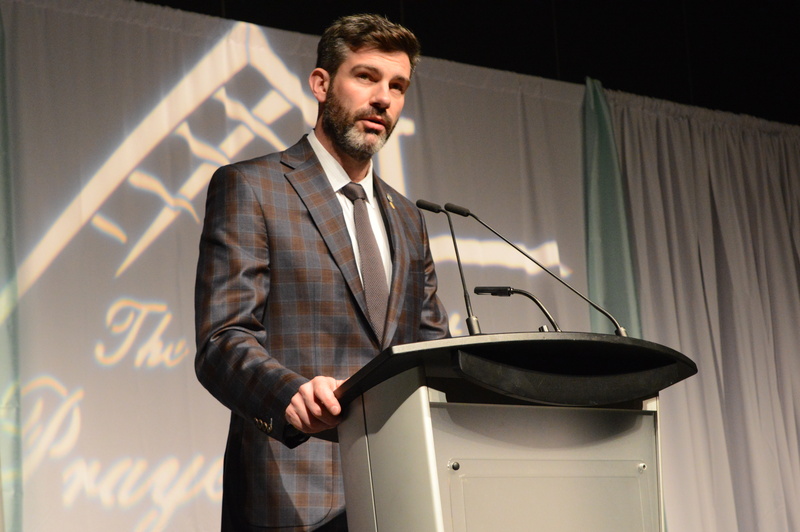 “This was probably the worst building season that I can ever recall, for weather,” said Friedel. Since the old furnaces had been taken out, the parish turned to propane heaters throughout the winter, which pushed the heating bill over $75,000, compared the usual natural gas bill of about $5,000. 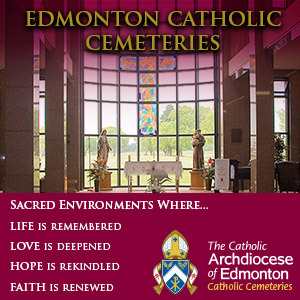 For parishioners, particularly the elderly and parents with young children, the greatest inconvenience was having to use temporary outside washrooms that winter. 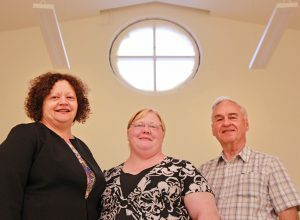 For Jensen, pastoral associate Sister Mara Ubalde, and receptionist Jackie Coulombe, there was the inconvenience of trying to operate the parish out of a neighbouring house for 18 months. 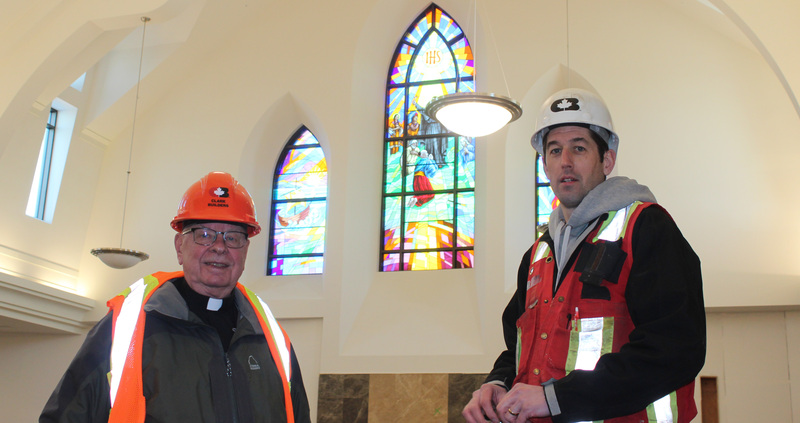 Despite the setbacks, Friedel and Jani are grateful to the parishioners who jumped into help once the project finally got going. It’s a bit of a tradition at St. Matthew, said Jani. 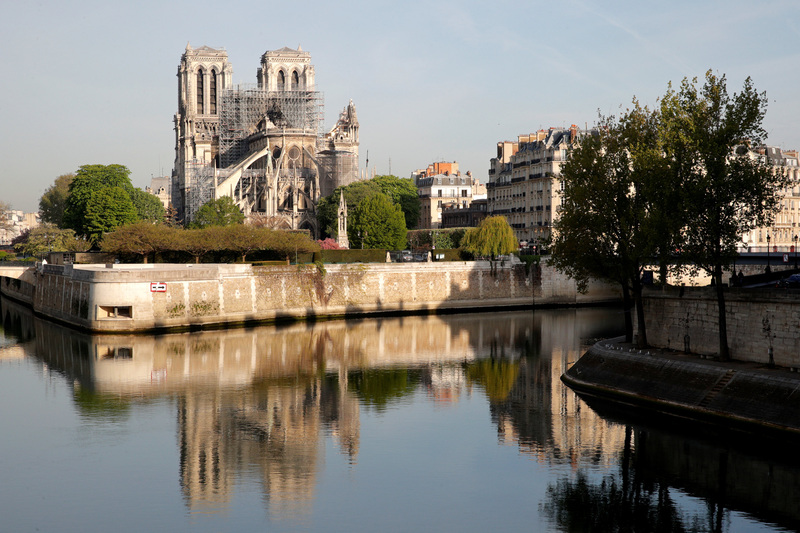 The parish is continuing a $750,000 fundraising campaign to pay off the project. With generous contributions from the Catholic Women’s League, Knights of Columbus and individual parishioners, they’re over halfway to the goal. A week before the grand opening, the site was still an active construction zone, because the parking lot needed resurfacing to repair the ruts left by heavy machinery.